Searching old documents online is awfully convenient. Digitized books, directories and newspapers are key in piecing together the history of a building and the people who lived there, and while the technology is pretty good (certainly beats sitting in a basement, sifting through microfiche), it’s far from perfect. The keyword search engine gets confused easily, particularly with numbers. If the scans aren’t clear, searches involving 3s, 5s, and 8s can get mixed up very easily. 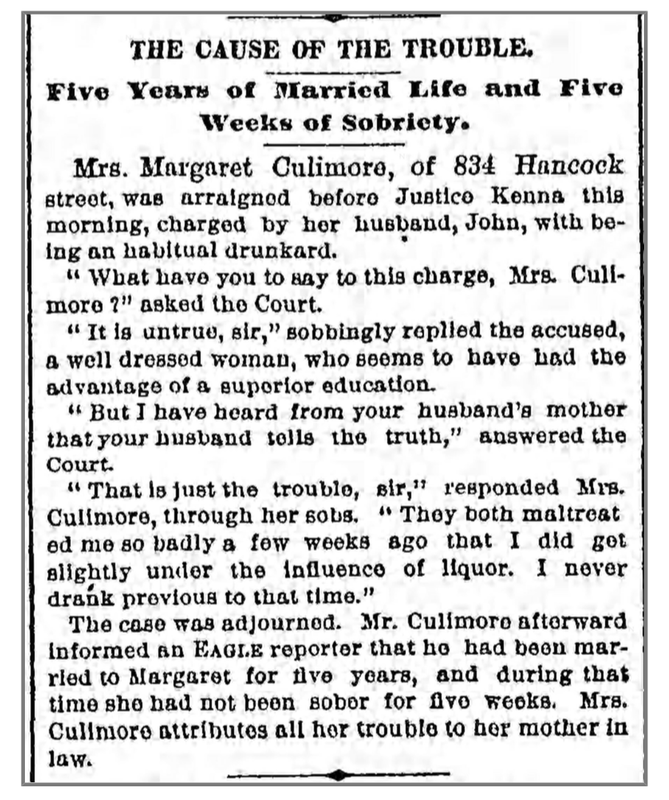 Happy Monday, I hope yours is better than Mrs. Culimore’s. Love how stories were told back in the day!! I have found several historic articles that were written just like that when I did research on our 1918 four square. Its a picture into the past. I know! I felt so bad for Mrs Culimore. Her family sounded like a nightmare, and the reporter seemed a tad judgmental – although that last line in the story is gold. Pure gold. Somehow don’t see that being approved by modern day editors.